Friday's MMI was down, but once again it was advised not to take that for granted. The mood pattern was irrational and risk averse, but there was also an implied desire to look at the bright side and it was cautioned that this could win out. The market started the day sharply down, but by the end of the day it was just north of zero. There was a multi-day high magnitude MM turn date from 2/5-2/8 with 2/8 being the focal point. After observing the market's behavior, my base case is that 2/5 marked the high and today, 2/8 marked the end of this 4 day turning point, a first leg of a longer downturn. MMI for Friday was: close down; S&P 500 closed +0.07%. The weekend MMI is net up for Monday open. A complex mood pattern, and a signal flip over the weekend add uncertainty and likely turbulence prior to RTH open. Monday's mood pattern reflects strong emotions and MMI is pointing down (below open). Sharp drop alert: Conditions are still present for a sharp drop alert (overbought + flatline, see 1st chart below). The Moving Average Momentum (MAM) Indicator's last major high signal was 11/1-9. The closing high on 11/7 fulfilled that. The last major low signal was 12/24-31. The market rallied strongly after the close on Dec. 24 which fulfilled the major low signal. The primary outlook is that a corrective move is in progress. Weekly charts are primarily down over the next few weeks. Monthly charts shows the market to be primarily in a corrective mostly downward move through March then turning up. A next low is anticipated February/March. MM MACD signal is NEUTRAL and the intermediate trend is UP. There is no swing trade signal. The long term forecast continues in bullish territory. Since a two year bullish trend has recently concluded, the trend may now vacillate between bearish, neutral and bullish for a bit before firmly deciding on its long term trend. The long term trend is indicated by the general divergence between the stock market and the mood generated forecast (see long term chart below). 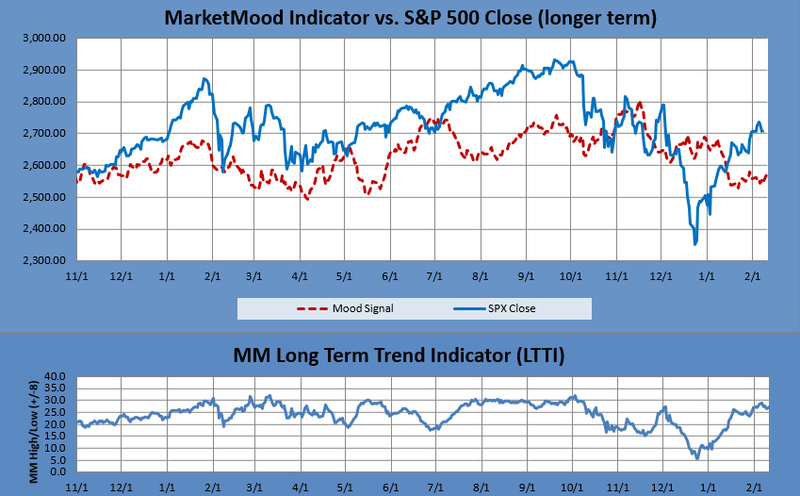 The MM Long Term Trend Indicator (bottom chart) which is derived from this divergence, indicates: Bullish Trend, enter bullish long term positions. The MM LTTI has had this indication since 27 Dec., 2018.